Jose Mourinho’s turn at the recently rotating tiller of United management began in earnest on Sunday with a 3–1 victory away at Bournemouth. The team selection was a typical 4231 with the slight surprise of a Herrera-Fellaini midfield and Mata coming in for the still-injured Lingard instead of Mkhitaryan. Mata, of course, tended to come inside, opening up space for Valencia, but also occasionally caused Mata to hilariously drop between Bailly and Blind for a three man defense while in possession. Mourinho continued his long con of playing Rooney as a number 10 competing with Ibrahimovic for the center space behind the nonexistant striker. Mourinho’s first game in charge showed a few interesting hints of possible stylistic change from last year. All four defenders and the midfield two seemed much more agressive in their tackling, closing down defenders with swiftly and with an intent to make contact. Mourinho’s reputation for favoring size and speed was evident in Bailly and Fellaini’s play while Blind and Herrera also seemed eager to get stuck in. The forward four were industrious in their pressing with Mata and Martial particularly showing a willingness to pursue the ball during transitions. After seeming a bit laxadazical in his defense duties last year, it was nice to see Martial’s willingness to track back and press for the ball. Martial’s defensive instincts are still a work in progress, however, as Smith snuck behind him into space before scoring Bournemouth’s only goal. Martial also came under a bit of undue criticism as well for being uninvolved in attack for the second game in a row after the Community Shield. Martial was time and again disserved by his midfield partner, Fellaini, who was continually unable to provide the passing needed to release Martial. When Martial did manage to get the ball, often thanks to Ibrahimovic’s hold up play or Shaw’s runs, he showed a willingness to beat a man and play a good pass, and ultimately was credited for two assists on the day. Fellaini’s lack of connection with Martial was illustrative of a larger theme of United’s midfield pairing being relatively ineffectual in attack. 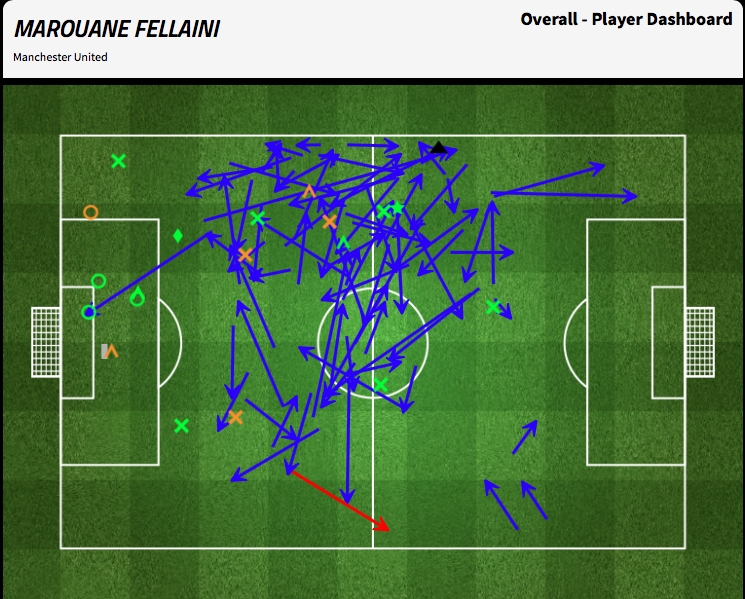 Despite their commendable defensive effort, both Fellaini and Herrera seemed to struggle with unlocking Bournemouth when in possession, lacking the tempo and accuracy needed for the most part without much influence over the dominant center area in front of the opposition’s box. Of course, an inability to unlock defenses when in possession is not a new problem for United’s midfield over the last few seasons, but Mourinho was able to inject some temp in attack thanks to the vertical passing of the center backs, as Blind especially was able to pass through the defensive lines on multiple occasions, with help from Rooney’s smart movement. Blind’s status in the team is a bit uncertain with Smalling due back, so it remains to be seen if United are able to maintain this level of agressive forward play from the back in future games. The team as a whole showed an easy willingness to play the long ball forward to take advantage of Ibrahimovic, Marital, and Fellaini’s size, another possible solution to the midfield’s inability to create play. The commentators noted Mourinho’s touchline criticism to some of Bailly and Blind’s longer passing during the game, and surely this impotent a midfield could not be Mourinhos ideal. Looking ahead to future matches under Mourinho one suspects that direct passing from the back and long balls up to Ibrahimovic will mainly be useful as only Plans B and C once the midfield gets up to speed with the addition of Pogba. Signs of a more functional midfield strategy were present at times, where United would build play on one side of the field, breaking through defensive lines before quickly switching play to the other side into open space. Herrera released Valencia for one such move in the first half which led to a Rooney chance. One can picture a more competent and incisive United midfield where Pogba can break pass defenders with pace and skill, drawing more help and pulling people out of position which his teammates can then take advantage of. And the prospect of a Shaw-Pogba-Martial left-sideattack is mouthwatering. Fellaini and Herrera were perhaps a surprising pairing in midfield, but Fellaini’s size and defensive diligence matched with Herrera’s passing and forward movement could be seen as the JV version of a potential Pogba-Carrick pairing in weeks to come, with Carrick being able to handle the defensive duties and pass forward while Pogba uses his size to counterpress and then rampages forward to open up options in attack.